With Baracci Solutions help, your business will be empowered to connect, engage and interact with your ever growing mobile web clientele. Mobile websites are rapidly becoming a crucial element of every business’ web strategy. Baracci Solutions’ Mobile Web Design team is composed of highly qualified and inspired web designers and professionals from the Greater Montreal area that work hand in hand to offer creative, trendy and seamlessly integrated Mobile Web Design Solutions. Our well established Mobile Web Design methodology allows us to ensure that our customer’s mobile design needs are not only met but constantly surpassed. Our Mobile Web Design process begins with a hand drawn sketch by our Web Creative Director followed by a mobile website storyboard and a mobile website wireframe. 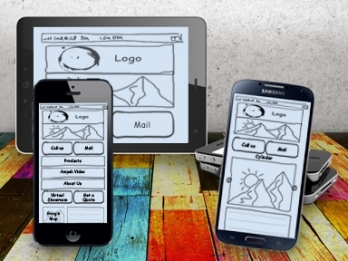 We then proceed to create concept art and various mobile website mockups. Baracci Solutions creates high quality interactive mobile applications applications for clients in Montreal, across Canada and around the World. Our mobile web application team has the experience and mobile technology knowhow necessary for the creation of easy to use, efficient and functional mobile applications for smartphones and tablets. Baracci Solutions can develop truly personalized, high quality and effective mobile applications that portray your business’ visual identity. Moreover, we can create various versions that will cater to the Apple, Android and Windows mobile clientele. Baracci Solutions aims to empower companies in Montreal, nationally and internationally to connect, engage and interact with their mobile web customers by helping businesses offer unique and compelling mobile websites and mobile applications to their clients. Moreover, we create state of the art mobile web marketing events including Bluetooth proximity, mobile couponing and QR code campaigns. Let us assist you in establishing your mobile web presence by providing you with the right mobile technology solutions and the right mobile web strategy. Creating state of the art mobile marketing campaigns.